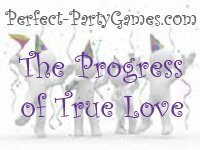 Summary: The Progress of True Love is a word game where you must insert the proper affininitve to complete the love story. Give each player a game sheet with a pen or pencil. Allow 5 minutes for the players to correctly guess the affinitives in the love story.